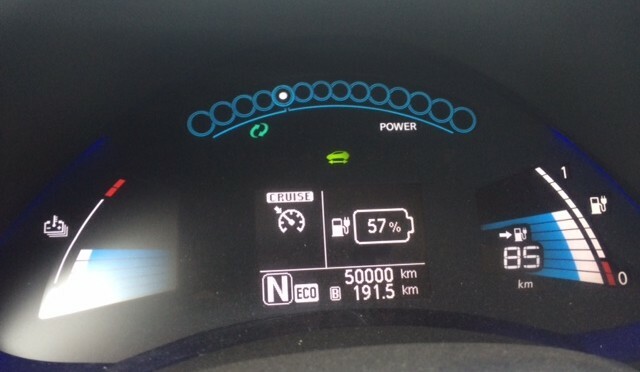 Well, I crossed over 50,000 km with our 2014 Nissan Leaf today, so I thought this would be a good time to take a look at where we are with costs to-date. I’m quickly approaching the cross-over point where the Leaf is cheaper than a Prius. 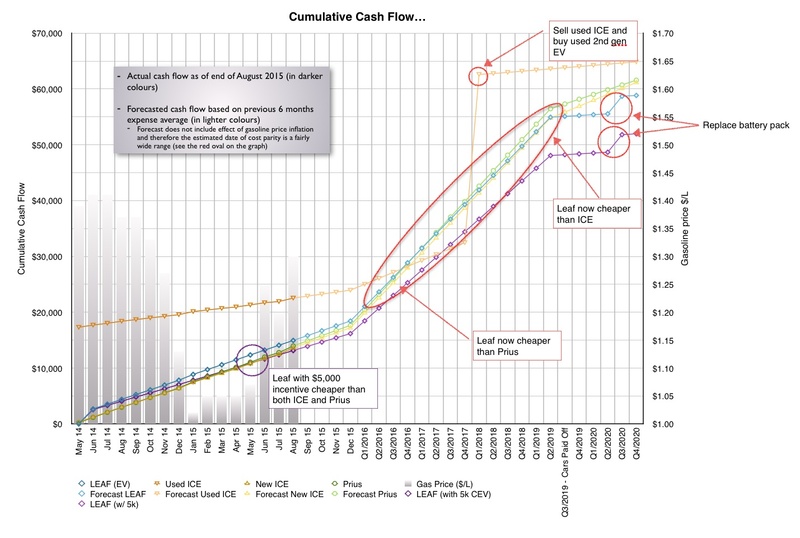 The price of gas over the next few years will determine when I cross-over to lower cumulative cost than an equivalent infernal combustion car. I’d be cheaper than both already if the Clean Energy Vehicle incentive had been available when I purchased my car. Something else to note is that a person looking at a Leaf today would have many viable used options to choose from; when I was looking, there were no used 2013 cars available and there weren’t any until late 2014. Now you can get a used 2013 SL (same trim) for about $25k. I still have all 12 of my capacity bars, though I think I am somewhere around 5% less capacity than when I bought the car. It is hard to tell! How are you finding 90% efficiency for charging? I find DCFC that bypass charger circuit to be 90%, and L1 to be 80%. I suspect L2 to be slightly better than L1, but not 90%. I use more conservative estimate of 80%, not that it would change things much. 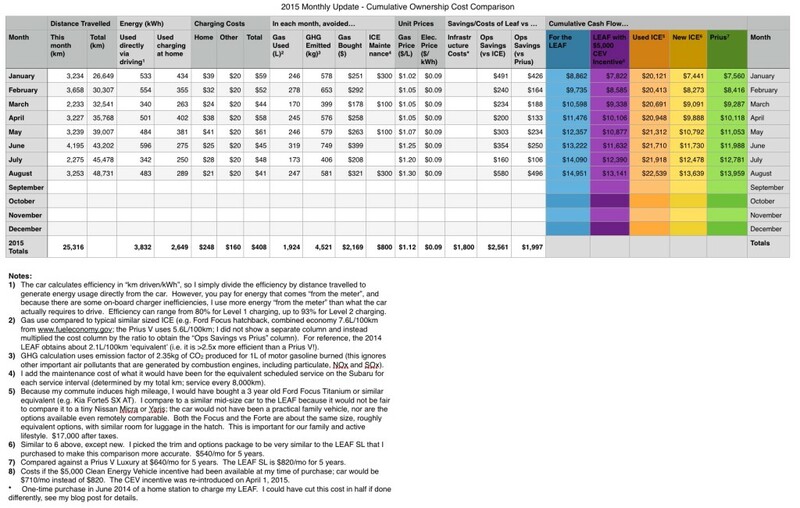 I don’t have a good way to directly determine charging efficiency; my energy meter at home only displays to the nearest kWh, so I would need to average the data over a period of a few weeks of ONLY charging at home to correlate to my calculated energy consumed from the information the car gives me. Unfortunately I rarely go more than a few days without charging somewhere other than my home. I’m also not entirely confident that the information the car gives me is correct, because the % battery used does not seem to correlate well with the energy consumed (calculated from the efficiency shown and distance travelled). The long and short of it is that I don’t think I will ever be able to calculate the efficiency of my on-board charger. You can read my blog to see how I found the efficiency. It involves starting with full charge, then measuring energy delivered to the car using Kill-A-Watt (KAW) and comparing to energy use reported by car. I used the same method to find DCFC efficiency. I don’t know if there’s 240V KAW. Alternatively, you can use true RMS meters for voltage and current. You can capture the video of this and integrate over time to find energy delivered to the car and compare to energy use reported by the car. Another method would be to use public L2 that shows energy delivered, although this could cost you more than 20 MPG gas car (eg. Blink). But it’s only few times to make measurements, so it’d be cheaper than buying true RMS meters. I didn’t bother with L2 since I have L1 efficiency, probably lowest efficiency possible. Of course, this all assumes you’re really curious. Grok on, dude!